Two pentafluorinated β-diketone ligands, 4,4,5,5,5-pentafluoro-1-(4-methoxyphenyl)pentane-1,3-dione (PFMP) and 4,4,5,5,5-pentafluoro-1-(4-dimethyl amino-phenyl)pentane-1,3-dione (PFAP), had been employed to synthesize six novel europium (III) complexes with ancillary ligands 2,2-dipyridine, 1,10-phenanthroline and 4,7-diphenyl-1,10-phenanthroline. The synthesized europium (III) complexes were characterized by FTIR, 1H NMR, UV–Vis, luminescence spectroscopy, elemental analysis and thermogravimetric analysis. The photoluminescence spectra of these complexes showed the typical europium (III) red emissions in solid state and chloroform solution, assigned to 5D0 → 7Fj (j = 0–4) transitions. The higher values of intensity parameter Ω2 indicated that the europium ion was in a highly polarizable ligand field in these complexes. Europium (III) complexes with the β-diketone PFMP exhibited much better photoluminescence properties than complexes with the β-diketone PFAP. Especially, the europium (III) complex of the β-diketone PFMP with the auxiliary ligand 2,2-dipyridine displayed the longest lifetime value, the highest quantum yield and good CIE color coordinates matching the pure red color (x = 0.67, y = 0.33) in these complexes. In addition, the proposed energy transfer mechanisms and the thermal stability of these complexes were also investigated and analyzed. 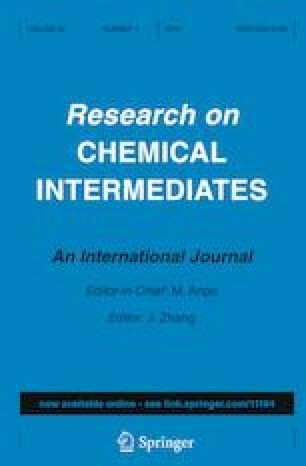 The online version of this article ( https://doi.org/10.1007/s11164-018-3691-7) contains supplementary material, which is available to authorized users. The authors gratefully acknowledge financial support from National Natural Science Foundation of China (No. 21542009) and Foundation for Hubei Key Laboratory of Pollutant Analysis and Reuse Technology (No. PA160203).